One key step in synapse formation is the recruitment and the stabilization of neurotransmitter receptors in the postsynaptic membrane. The neurotransmitter receptors traffic in neurons from their exit of the endoplasmic reticulum to the postsynaptic membrane. However, the routes used by the neurotransmitter receptors to reach the synapse remain unclear. Over the last decade, two paths have emerged. On one hand, neurotransmitter receptors cycle to and from the plasma membrane through exocytosis and endocytosis processes, respectively, and can be inserted to the postsynaptic membrane by vesicle exocytosis. On the other hand, neurotransmitter receptors diffuse at the surface of neurons (lateral diffusion) and may thus diffuse to the synapse from the extrasynaptic membrane. Since it appears that most cycling events take place in the extrasynaptic membranes, both cycling and surface trafficking processes are likely involved in the regulation of the number of synaptic neurotransmitter receptors. 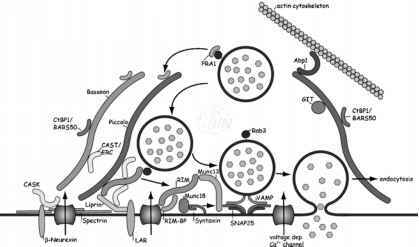 The first report of neurotransmitter receptor lateral diffusion came from studies in the early 1970s in which acetylcholine (ACh) receptor trafficking was investigated at the surface of cultured muscle fibres1,2. But it was only 30 years later that the lateral trafficking of neurotransmitter receptors at the surface of neurons was reported3-6. Since then continuous improvement of the tracking technique using live imaging has been achieved, giving to neurobiologists the tools to localize fluorescent molecules with sub-wavelength precision and to identify receptor sub-populations. The use of nanometre-sized ligand-fluorophore complexes has even made possible to track targets within confined cellular compartments, such as the synaptic cleft. Since excitatory as well as inhibitory receptors exchange between extrasynaptic and synaptic membranes, the regulation of receptor numbers at postsynaptic sites is therefore likely to also depend on lateral diffusion. Moreover, the role of neurotransmitter receptor lateral diffusion during synaptogenesis has been proposed1,2. In this chapter, we discuss (i) the principles and the experimental approaches to analyze receptor lateral diffusion, (ii) the plasma membrane as a space for diffusion, (iii) the evidence that neurotransmitter receptors diffuse at the surface of neurons, and (iv) the lateral diffusion of neurotransmitter receptors during synaptogenesis. where y is Euler's constant. The weak dependence of D on R has been experimentally shown11 and this explains why clusters of receptors can diffuse at the same rate as individual receptors. However, as mentioned earlier for proteins in biological membranes, the measured values of D are lower than is expected from the viscosity determined from measurements of lipid diffusion. Experimental evidence has now shown that interactions with obstacles in or beneath the membrane are mostly responsible for the unexpected low value of D (see Section 5). As shown in the equation above, temperature is a critical factor that influences diffusion within membrane. Experimental evidence has indeed shown that temperature change of 10-15°C induce approximately 2-fold change in protein diffusion coefficient within plasma membrane12,13. Such factor is thus critical and it has thus to be taken into account for biological experiments. The first experimental approach that measured protein surface trafficking was the fluorescence recovery after photobleaching (FRAP) technique2. In this approach, molecules of interest are tagged with a fluorophore (e.g. fluorescent irreversible antagonist or antibody). A small area of the cell is quickly photobleached by intense excitation light and the rate of fluorescence recovery in the excited spot is monitored over time. The recovery then depends on the protein mobility from the area surrounding the bleached spot. Although this technique unravels the surface diffusion of several proteins, it only gives bulk estimates of protein mobility, as the movements of thousands of molecules are averaged and it has limited spatial resolution (~200 nm). The emergence of single particle tracking (SPT) experiments allowed real-time monitoring of the movement of individual or a small group of proteins14. In the SPT approach, sub-micrometre-sized particles are bound to the protein of interest, such as neurotransmitter receptors, through ligands that recognize the extracellular domain14-16. These ligands, such as antibodies, are either passively adsorbed or covalently linked onto the particle, which can be made of latex (0.1-1 |j.m diameter), gold (40 nm diameter) or silica. Particle diffusion, and therefore diffusion of the underlying receptors, is imaged by video-enhanced differential interference contrast microscopy or fluorescence imaging. The relative position of the particle is then measured with an accuracy of 1-10 nm. The size of the tag does not largely influence the movements, which are dominated by Brownian and viscous forces because membrane viscosity is approximately 500-fold greater than that of extracellular fluids. The membrane-anchored receptors by themselves slow down the particles and not the opposite. 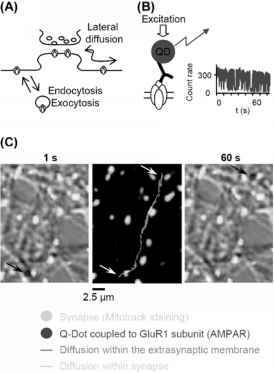 One clear disadvantage of such approach in neurons is that it allows only the tracking of extrasynaptic receptors, as the size of particles excludes the tracking of receptors within the synaptic cleft, which is approximately 20 nm wide for excitatory synapses. 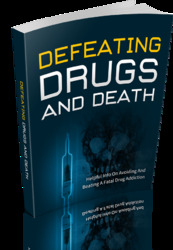 An alternative approach is thus to use particles of small diameter that can track for long periods of time. This can now be achieved using quantum dots (QDs) that are nanometre-sized semiconductor fluorescent particles providing long-lasting fluorescence emission (virtually no photo-bleaching). However, despite these attempts to minimize the particle size, even the smallest ones (e.g. QDs) used to track receptors within confined spaces have shown limitations, likely because of the complex size17. Actual improvements in the QD structure, such as reduction of the core (few nanometres) or the organic shell sizes, will likely overcome this issue. A new photothermal detection method has been developed and allows optical imaging of small gold particles (down to few nm diameter)18 that could in addition be used to track receptors inside the synaptic cleft. To investigate tracking of individual receptors in confined space the single molecule detection (SMD) of labelled antibodies directed against extracellular epitopes of the protein of interest has been used. SMD has emerged with the improvement of charge-coupled device (CCD) camera sensitivity and it allows imaging of single synthetic fluorophore (e.g. cyanine 3 or 5) or fluorescent proteins (e.g. GFP and DsRed) under epifluorescence19-21. To gather sufficient photons to image one dye molecule, the preparation must be excited at saturation through a defocused laser. However, this accelerates substantially the photobleaching, and thus single dye molecules can usually be imaged for only few seconds (at 30 Hz rate acquisition). Thus, the SMD approach provides the advantage of small probe size that enters confined space but provides the disadvantage of a limited tracking time. Finally, an alternative approach, the fluorescence correlation spectroscopy (FCS) has been developed. Using FCS, the mobility of individual fluorescent molecules is measured as their residence time in a small confocal illumination volume. The faster molecules diffuse, the shorter their residence time is in the excitation volume. As with FRAP, this approach gives measurements of the population mobility. Furthermore, it is limited to the measurement of rapidly moving molecules, as the fluorophore must remain active during the whole period of residence in the measurement volume and not photobleach. Using all of the approaches mentioned above, movement of membrane proteins, such as neurotransmitter receptors, can be classified into five main categories: stationary, free diffusion, directed diffusion, confined and corralled diffusion22. Hypotheses that the plasma membrane is compartmentalized and form microdomains have thus emerged. Such microdomains can consist of sub-membranous fences, mobile obstacles and variations in membrane fluidity in sub-compartments23-25. Many membrane proteins diffuse rapidly within a constrained space for short periods of time and then escape from these areas24,26. FRAP experiments27 and the measurement of the barrier-free path of transmembrane protein movements by SPT28 indicates that barriers do indeed restrict the membrane protein lateral mobility. Diffusion is more restricted for proteins with an intracellular tail that protrudes 2-3 nm below the membrane than for truncation mutants with shorter intracellular tails or glycosylphosphatidylinositol (GPI)-anchored molecules8,29. All together, these results have favoured the cytoskeleton-fence model30 in which the diffusion of membrane proteins is dependent on the imperfect and fluctuating network of the membrane-associated portion of cytoskeletal proteins. Escape of proteins from these domains can be accomplished by hopping the corral fence31. However, the cytoskeleton-fence model cannot account for all of the experimental data since even the diffusion of GPI-anchored proteins and phospholipids (present in the outer leaflet of the plasma membrane) are compartmentalized32,33. It was further demonstrated that the com-partmentalization of these probes depends on the actin cytoskeleton, but not on the extracellular matrix, extracellular domains of proteins or lipid composition32. Such confinement was interpreted as resulting from long-range interactions between membrane proteins, explaining the contradiction from the original membrane model in which the size of the probe was theoretically not influencing the lateral diffusion. The picket-barrier model32 emerged as a variation on the general scheme of diffusion in the presence of obstacles in which transmembrane proteins anchored to the membrane skeleton are called pickets and act as posts along the membrane skeleton fence (Figure 15.1). Figure 15.1. Schematic View of the Plasma Membrane Compartmentalization. The small compartments are made of sub-membranous cytoskeleton meshwork (e.g. actin), the so-called "fence", together with rows of stabilized transmembrane proteins, the so-called "pickets". These pickets can then be viewed as effective diffusion barriers due to steric hindrance, and might likely affect phospholipid movements. In conclusion, the plasma membrane can be viewed as a mosaic of sub-micrometre domains, within which diffusion is as fast as expected from theory. Fences that restrict transitions from one compartment to another separate these transient domains, thereby decreasing overall diffusion. In addition, the above mechanisms cannot account for the full topological and dynamic complexity of membrane protein distribution in neurons. Interacting proteins from intra- and extracellular compartments have been proposed to anchor receptors and thus strongly affect their lateral diffusion. AMPAR number by increasing their internalization43'55. Consistently, glutamate application increases the lateral diffusion of AMPARs which leave the synapse to the extrasynaptic membrane followed by an entry in the constitutive endocytotic pathway13,56. Furthermore, glutamate induces a dissociation of AMPARs from transmembrane AMPA receptor regulatory proteins (TARP). Altogether, these data point to the need for a pool of diffusive extrasynaptic receptors to regulate synaptic receptor number, and synapses may then envisioned as donors or acceptors of exchanged receptors (Figure 15.2A). Figure 15.2. Receptor Lateral Diffusion at the Surface of Live Neurons Revealed by Single Particle Tracking. (A) Schematic representation of the two main pathways for neurotransmitter receptor trafficking. First, neuro-transmitter receptors traffic to and from the plasma membrane by exocytosis and endocytosis, respectively. Second, neuro-transmitter receptors diffuse laterally within the plasma membrane and they can even exchange between the extrasynaptic and synaptic membranes. (B) Quantum dot-based single particle tracking is based on the coupling between a single quantum dot and the receptor of interest via an antibody directed against the extracellular domain of the receptor. Note that the fluorescence emission of the quantum dot is stable over time, although blinking occurs (right panel). (C) Trajectories of a GluRl-containing AMPAR (60 s duration). Neurites are shown on right and left panels (differential interference contrast images). Note that the AMPAR diffused along a neurite and crossed two synaptic areas over this time period. See Colorplate 9.